This is the first time I'm joining a bloghop and May's theme from Sweet Adventures BlogHop is "what's your cup of tea?". Tea flavoured cupcakes seem to be quite popular, and it didn't need a lightbulb moment to connect Chai + Cupcakes = chai tea cupcakes. All I needed was a cupcake recipe which has liquids as an ingredient so that I can incorporate the chai into it. This recipe produces a pretty airy-fairy, almost delicate cupcake with a lovely moist crumb which holds well. 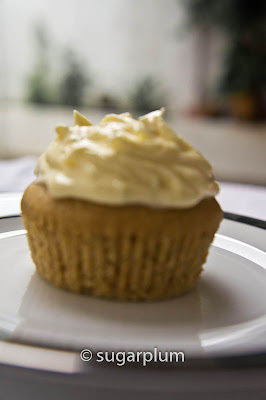 For the frosting, I kept it to a simple vanilla buttercream so as to not overpower the cupcake flavour. The vanilla buttercream enhances the chai flavour and rather resembles the steamed milk component in a store-bought chai. I didn't pipe the frosting over as I preferred to slather it on with a palette knife and create the jagged peaks. 1. Prepare the chai first so that it has time to cool. 2. Line a muffin pan with cupcake liners, preheat oven to 350F or 177C. 3. 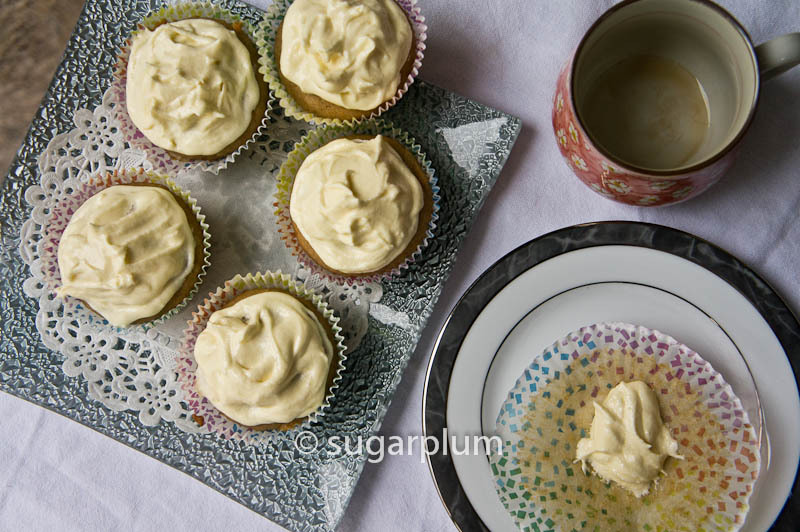 For cupcakes, beat the butter and sugar until light and fluffy. Add eggs in, one at a time, beating well after each addition. This incorporates air into the mix and makes it light. 4. Mix the flour, baking powder and salt and sieve together. 5. Fold the flour and chai into the creamed butter mixture, in 3 additions. Flour, chai, flour, chai, flour. Be gentle as you don't want to stir all that air out. 6. Fill the muffin cup with the batter and bake about 17 - 20 minutes or until a toothpick comes out clean. Do not over bake as the cupcakes will be dry. Check at 17 minutes with toothpick. 7. Remove from oven, and place on wire rack to cool. Ensure the cupcakes are completely cool before frosting otherwise frosting will just melt and run off. 1. Bring water and spices to boil and throw in the teabags. Add in the milk, simmer for 10 minutes and stir constantly. Remove from heat and cool before using. Alternatively, place in a microwaveable jug and microwave for 4 minutes on 30 second bursts. Be careful as milk tends to boil over and teabags may burst. 2. Sieve the chai and squeeze the teabags to extract all that tea flavour when ready to use. 1. Beat the butter until light and smooth. 2. Add in a few drops of vanilla extract and half the icing sugar. Beat on low speed until smooth, then add in the remaining icing sugar. Continue beating until frosting is light and fluffy. If you need to loosen it a little, add in a teaspoon of milk. In our hot humid weather, I had to chill it for 15 minutes before I could use the frosting as it was too soft to work with. Don't worry if the creamed butter mixture looks a little curdled as you add the eggs in. Just ensure you beat well after adding each egg. Once you fold in the flour, it will be fine. The chai for this is stronger than the usual drinking version as I wanted the tea and spices to dominate the butter and eggs. So don't worry if it the chai turns out quite dark. 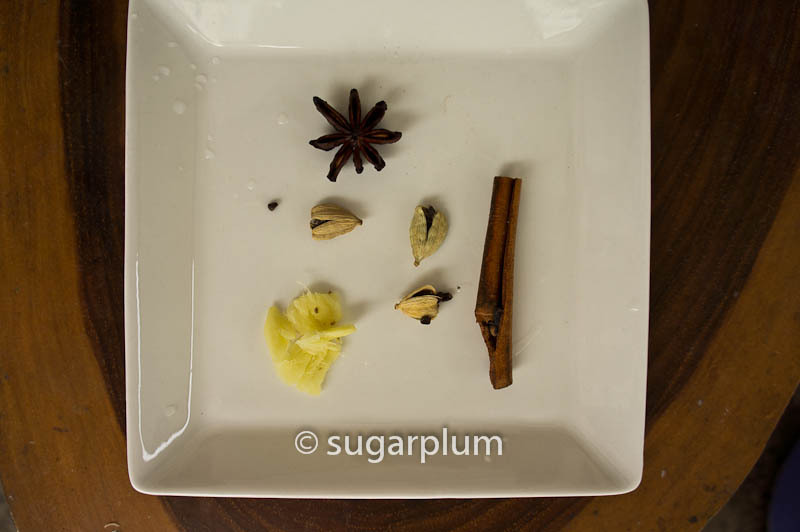 Watch the chai as it simmers on the stove or heats in the microwave. Stir, stir, stir. It boils over very easily. Some teabags aren't very robust and tend to burst. Just sieve before using. I smash the ginger and cardamon pods so that the flavours release easier. I used a simple 4 :1 ratio of icing sugar to butter for the frosting. This way you can make as little or as much frosting as you want. Chill the frosting to firm it a little if you find it too soft to work with in the tropical heat. 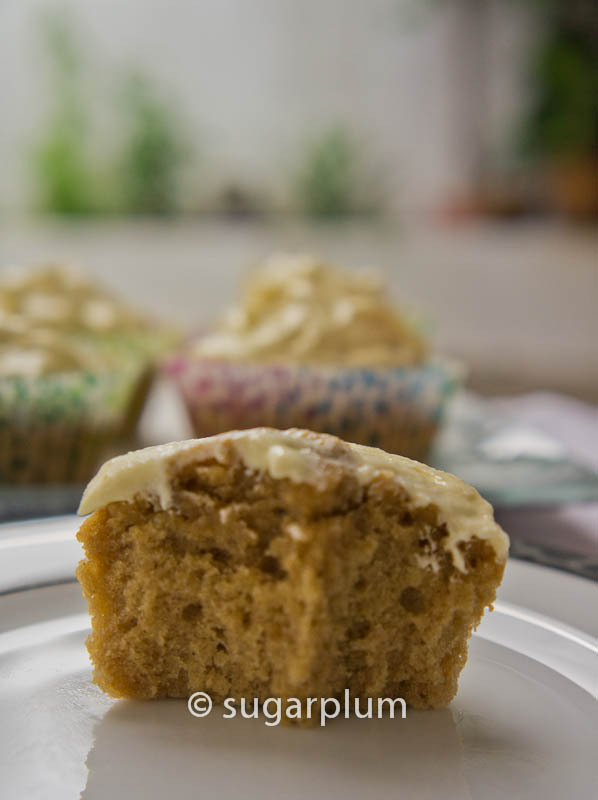 Love chai tea and love cupcakes, too so anything that combines both these things has to be good! Thanks for joining us for the bloghop! Thanks Christina. Best of both worlds, can't agree more. Ooh I love these. Your buttercream looks delish :) Thanks for joining the hop! Haha it's my very first attempt at buttercream. Lucky for me, it turned out fine too :) thanks for stopping by. 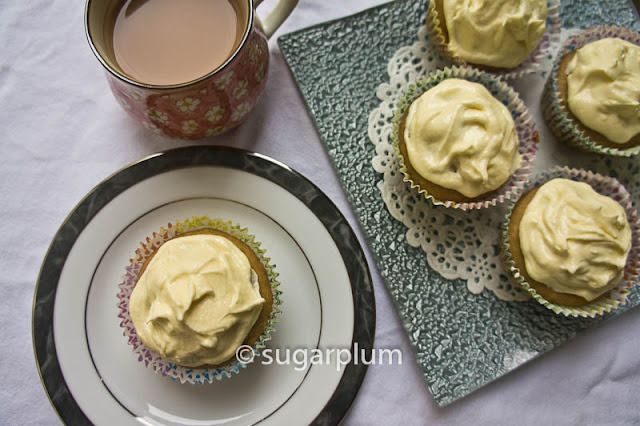 Yummy looking Chai Tea Cupcakes and very homely looking! Thanks for hopping over, Moya. I'm glad you like the way they look as I can't pipe icing for nuts. 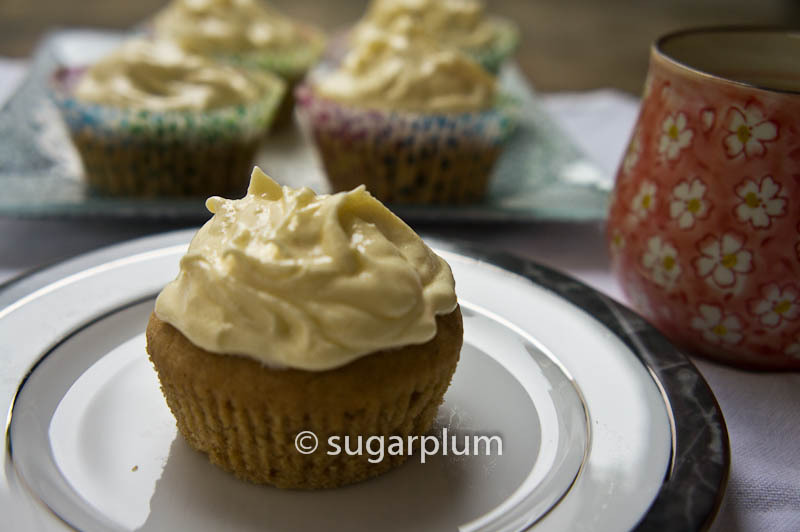 As a chai lover and a cupcake lover your cupcakes sound amazing. They look like they have a lovely fluffy texture. So glad you could join us! I do love chai and your spice combo sounds wonderful. Great little cakes! Hi Jennifer and JJ, it's been an interesting experience joining a bloghop and I hope to challenge myself more. So thanks for hosting it. Looking foward to June's challenge. Hi Monica, thanks :D It's amazing what icing can do to jazz up a cupcake.